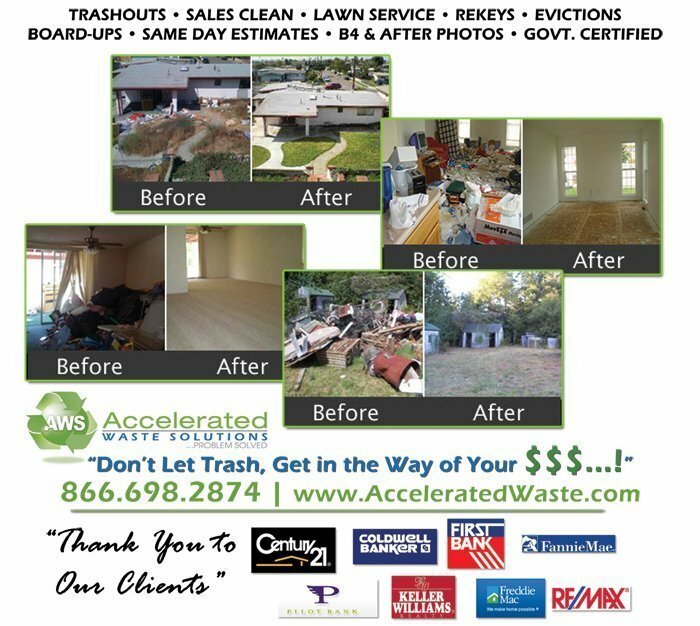 Junk Shot and it’s parent company Accelerated Waste Solutions (AWS) offers an array of services that protect and preserve our client’s collateral throughout the period of the foreclosure process or the sale of property. AWS offers professional services to asset managers, lenders, banks, insurance companies, owners, and the Realtor community. We take great pride in our ability to perform quality work, with quick turn-around times, at fair and reasonable prices. AWS thoroughly understands our client’s needs and keeps abreast of the continual changes with all investor guidelines. This ensures that all work is completed in accordance with the applicable specifications. Q: What makes AWS different from other property preservation companies? Q: What Property Preservation Services do you provide? Q: What investor guidelines are you familiar with? We are knowledgeable of all investor guidelines and service HUD, VA, Fannie Mae, Freddie Mac, and conventional loans. Q: How long does it take for you complete the average project? All work will be completed within 3 to 5 days from receipt of the Field Report. Rush service is available! Q: What technology do onsite crews use? All of our crews are equipped digital cameras with date stamps and Internet enabled tablet PC’s for remote photo uploads and instant communication with the office. We keep accurate records of individual jobs and property history. This reduces our job processing times for preservation and inspections to near zero. All reports and pictures are delivered via email. More confidence, security, speed, & peace of mind for you. Thankfully, the days of waiting or searching for faxed reports are Over! Optimizing time and saving money. That’s our goal. Q: What Kind of insurance do you carry? We carry General Liability, Commercial Auto, Errors & Omissions, Workers Comp and Excess Umbrella insurance. We provide services in Tampa-Hillsborough, New Port Richey /Wesley Chapel-Pasco, Clearwater -St. Pete-Pinellas, Lakeland-Polk, Sarasota, Bradenton-Manatee, Kissimmee – Osceola, Orlando-Orange, and Altamonte-Seminole counties of Florida.